Having studied the Paris maps I make a startling discovery. It seems that the Jardin des Plantes stop on the batobus is very near the Gare d'Austerlitz - what this means is a more easy trip to get the europass validated. After my London experience, traveling on the metro doesn't really appeal to me. Once again it's an early start - yes, it's probably still jet lag - and another trip to Notre Dame. Armed with the zoom lens this visit is about getting some shots of the details. 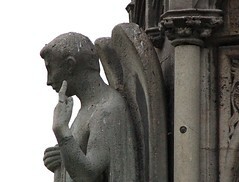 Even with a 300mm lens some of the higher gargoyles remain out of reach. I'm finding there's a different mindset to shooting digital versus film. At current numbers, so far on this trip I've probably taken over a thousand shots, something that just wouldn't be feasible with film. It's a learning exercise at the moment. Maybe this is making me more lazy in my approach - the proof will be in the printing, but that is a long way off. Is he giving me the finger? I don't know if you can tell from the photos but work is currently taking place on the exterior of the Church. The work started in 1991 was supposed to take 10 years - though the main facade is clear, scaffolding is currently around the side of the North Tower. This is a photo of the yard where the some of the items for repair are kept. On the Seine side the level of damage is quite severe - it almost looks like the faces of the gargoyles have been eaten away. 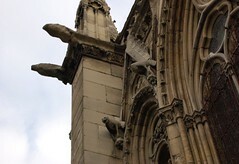 Here's a little architectural lesson - the gargoyles aren't those hideous faced things, the gargoyles are in fact the ones that are pointing straight out, they are the water spouts. 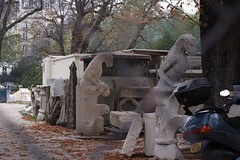 The correct name for the hideous faced statues are chimères. 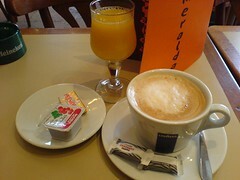 This morning I have breakfast at a cafe called L'Esmeralda around the rear of Notre Dame. This is a more reasonably priced €6.10 for which you get, a glass of orange juice, 2 slices of toast, jam, butter and a coffee of your choice. 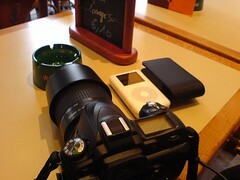 I also take the opportunity to clear the SD cards over breakfast - using the Ipod is proving to be such a neat solution. After breakfast I hop on board the batobus again and make my way to the Jardin des Plantes stop. On board a couple of old dears are taking pictures of themselves with Notre Dame as a backdrop. While I'm standing taking pictures of Notre Dame, one of the old dears comes up to me and asks "Would you like me to take a picture of you?" her words beginning to trail even before she finished the sentence. Maybe it was the look of abject horror on my face of the very thought of it. Maybe I'm not very good at covering my distaste for such things. I smiled and politely thanked her for the offer but it wasn't necessary. She then replied with a kind of puzzled expression "Oh, you just like to take pictures of" she paused as she tried to think of the correct word then finally uttered the magic word "things." I suppose you could say that. I like to take pictures of things. I just don't understand the whole concept of needing a photo of yourself standing next to, in front of, or nearby some object. It's a short walk to the station, well it should have been if not for the roadworks. Somehow I manage not to get myself run over as I traverse some major roads and before I know it, I'm at the station. The next part I must say was pretty painless. I not only managed to get my pass validated, I also got tommorows ticket for Brussels (you have to pay a supplement because it's a Thalys train, its €20 for first class) and I have the cabin booked for the night train from Barcelona. From the station I decide to take the opportunity to look around the Place Monge Market - it's only a short taxi ride away. This market takes place on Wednesday, Friday and Sunday whereas Place Maubert market takes place on Tuesday, Thursday and Saturday. You'll find that some of the stallholders are the same, they just move from one market to the other. 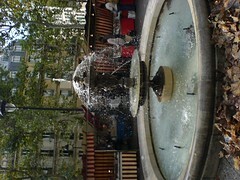 The market stalls fan out from a central fountain and you'll find a usual array of sumptious items. 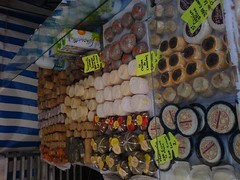 There's even that Lagioule stall from yesterday. I stay strong and decide against it - as it is I'm carting around too many things, I need to get rid of things not buy more. Though it's hard not to buy some of these gorgeous cheeses. In the afternoon I discover another constant of life - there are always queues in the post office. No matter what country or what time, you'll always have to wait. I also suffer minor heart failure at the cost of posting some of my excess baggage back home - *cough*thirty five euros*cough* and that's for sea mail! The rest of the night I've spent re-organising by luggage and getting myself ready for the train tomorrow. As for Paris, what can I say. First impressions weren't very good and it took a little while to warm up to it, but the markets have won me over. I'd like to come back, perhaps for a week or two, and take better advantage of the fact that I'm in an apartment with a kitchen!